After spending another weekend in Staunton, Virginia, I must repeat the recommendation I always make: “Hie thee to the Blackfriars Playhouse!” If you have never been, you will discover Shakespeare anew. If you have been before, the troupe and the theatre continue to engage and entertain. Through the end of March, the American Shakespeare Center is performing its Actors’ Renaissance Season. This means there are no directors and no designers. Everything is determined by the actors, and they put the plays up with minimal rehearsal. The Comedy of Errors, for example, had 20 hours of rehearsal, amazing when you consider the specificity of the physicalities. Naturally, things have evolved, grown, been dismissed over their two months of performances, but the continuity of the world created is a testament to these actors’ creativity and ability to work together. In contrast to the Dromios are the Antipholi, and John Harrell and Patrick Midgley give the clearest characterizations for these roles that I have ever seen. I completely saw Antipholus’s status as important citizen of Ephesus, which makes it all the more comical when things start crashing down around him. These Antipholi were elegant, deliberate men, dressed in nice slacks and purple vests. Midgley in particular nails the part of straight man, and the biggest laughs in the first half of the play are more due to his stillness, than the other characters antics. I’ve always had it in my head that I didn’t like The Comedy of Errors as a play very much, and I’ve discovered that this isn’t true. It’s not very deep, sure, and no one dies, but that’s not the kind of play it is. It’s fun and light, and it’s brilliant at being so. Working on the play gave me a grudging respect for it, and this production has furthered that. 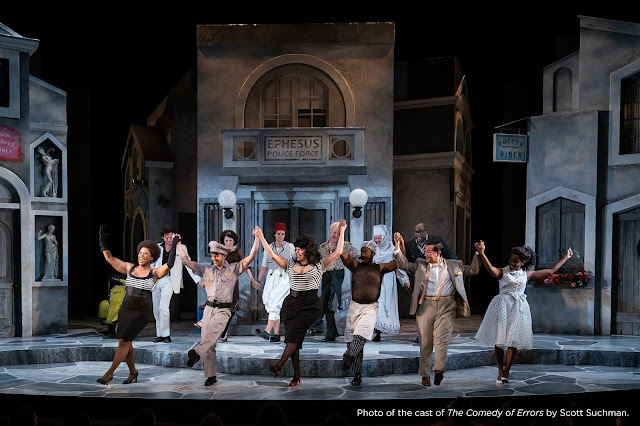 It’s very possible to find an unfunny production, or a production that tries to create the funny, rather than trusting Shakespeare’s funny, but when it’s done well, as it is here at the American Shakespeare Center, the delightful minutes fly by. This troupe also understands the brilliance of Henry VI, part 3. The Henry VI plays are too often dismissed as lesser Shakespeare, but there’s a lot there to admire. I love them (I’ve seen some version of them four times now), and I always want everyone else to love them as well. Henry VI, part 3’s greatest strength is in the way Shakespeare juxtaposes scenes of great frenetic energy with introspective soliloquies. It’s what makes this script rev up your excitement and pull at your heartstrings, and the actors at the American Shakespeare Center nail this element. The political and battle scenes are played at a high dramatic frenzy with percussive underscoring. It’s quickly clear which are the more capable actors, for being able to find vocal and emotional coloring while remaining at a high intensity is difficult. Paul Jannise, Jeremy West, and Jeremiah Davis, are capable with the text, but not quite up to the level as the other actors in the company. West makes very little impression as the Duke in The Comedy of Errors, and Jannise as the Duke of Oxford in this play falls into the trap of simply yelling all his lines. (Davis, though, is at his best in Look About You, bringing a sarcastic petulance to the role of Prince John.) Chris Johnston impresses, bringing a dangerous intensity to the part of Lord Clifford. And I have never seen better work from Sarah Fallon than what she does as Margaret in this play. She is harsh, dark, physical, slapping Henry at one point. She seethes in quiet rage. She unleashes with verbal acerbity. She is electric in her final scene, after her son is killed and she begs Richard (soon to be the Third) to kill her. (She faints at one point, and I love the cruel way in which Hasting revives her – he breaks her finger). Margaret in part three is a great role for Fallon; her emotional connection to the role is deep and always believable. Then there are the brilliant moments in between the battles and the arguments, moments where the playhouse falls silent, save for the voice of a single actor on the stage. When experienced in contrast to the sound and the fury of the other scenes, these moments have a cutting emotional impact. There are the moments you know will be like this, such as Henry VI’s (Gregory Jon Phelps) speech about being a shepherd instead of a king. But there are moments that take you by surprise as well. A prime example: Tyler Moss is superb during Warwick’s death speech; the audience was riveted to his every word. Sometimes the lack of an overarching vision shows through in this production. The blood work is inconsistent – sometimes wounds cause blood, and sometimes they don’t. It may be a little less clear to unfamiliar audience members who George, Duke of Clarence (Patrick Midgley) is. This partly due to the script – after all George does not appear in the first two major York family scenes. But also due to the fact that York, Richard, and Edward were wearing the same outfit, and George was wearing something completely different. Then, even more confusingly, Hastings appears in an outfit matching the Yorks, while George remains in a dissimilar look. It seems rather appropriate that Look About You, an almost never performed work, by we don’t know who, was our final play of the weekend. It was kind of a mix between COE and 3H6. The first scene and the last scene are a history play. Warring factions bicker over who gets to be king. Families are divided and reunited. Blows are exchanged, threats are made, and crowns are coveted. But in the middle of this history play is a madcap comedy of errors, where characters don disguises and are confused for each other. Much like Blind Beggar of Alexandria, seen on this stage two years ago, the craziness and many of the disguises center around John Harrell, here in the role of Skink, once hired to assassinate Rosamund, Henry II’s mistress (Eleanor’s possible connection to this murder also gets discussed in The Lion in Winter). Interestingly enough, also like Blind Beggar of Alexandria, one of Skink’s disguises is as a hermit (was this an early modern trope?). Special mention must be made of John Harrell’s impersonation of Prince John, complete with hilarious Muppet voice, as well as the scene where Robin Hood (Patrick Midgley) dons a dress, disguised as the fair Lady Marian. I was initially worried because the delivery of a couple moments seemed to be very tongue-in-cheek, as though the actors were making fun of the play, rather than meeting it on its own terms. Thankfully, this did not continue. The troupe at the American Shakespeare Center brought their considerable comedic abilities to this lesser script. The text seems to lose steam as the play reaches its end, but the hilarity that precedes that makes it totally worth it. There were two separate moments where I was laughing so hard I nearly cried. So there we have it. If you’ve never been to the ASC, what are you waiting for?? ?